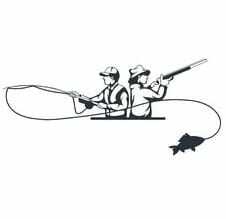 This year, will you go fishing or hunting? In our different ventures, we always want to move forward and succeed. To do so, we can adopt various strategies. However, some are more effective than others. Here are two points of view. What is the strategy of the fisherman? He goes to the water, casts his line and waits. This is a passive approach. What is the strategy of the huntsman? He carefully prepares then hunts down the game animal. He has to think like the animal and be astute. This is an active approach. In your work, what is your approach? Are you a fisherman or a huntsman? It can make all the difference! With the strategy of the fisherman, we wait passively for customers to visit our place of business. If one comes, we will serve him with interest and passion. But, if no one comes, we will blame it on something else: bad weather, slow economy, etc. With the strategy of the huntsman, we hunt down the customers. We do not wait for them; we go find them. We think like customers so that we can attract them to our place of business. How? It’s simple! By offering them what others do not: new homemade products, exciting promotions, exclusive activities, etc. In other words, we keep an active approach. If you are proactive (or wish to be more so! ), BSA is there for you. BSA can help you develop new processes and products. Thanks to our continuous improvements in research and development, we always have innovative products to offer you. Our numerous contacts in the food industry and our participation in international conventions allow us to stay up to date on new technologies, from processes to equipment. BSA is a reliable and lasting partner! Being active comes with the possibility of making mistakes. It will happen that the huntsman follows the wrong tracks. But that does not discourage him from trying! Remember: the fisherman rarely makes mistakes… because he only sits and waits! So, this year, will you go fishing or hunting?